By resolving Magento abandoned cart, you can convert high-intent customers and capture lost revenue for your business. In this blog, we cover the tools and strategies you need to get started. Cart Abandonment is a huge problem. An average eCommerce store loses 75% of its sales to cart abandonment with some studies reporting over 80% loss. Security of the checkout process. This blog focuses more on how to get all customers back to the store regardless of reason for leaving the first time. One massive eCommerce savior is the ability to send a follow-up email to the shopper with a link to restore their cart from their previous session. With most eCommerce platforms, including Magento, it is not possible to automate that process without an integration. This tedious task that most business owners don’t follow through with has the potential to lead to more sales, less abandoned carts, and future purchases from the same customer. Here at Groove Commerce, we were able to create a extension for this very task. Hubshop.ly is designed to link your current eCommerce platform, like Magento, to the marketing platform HubSpot. 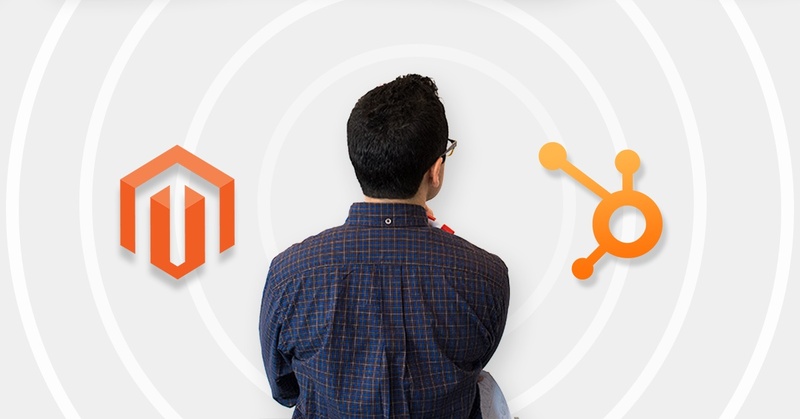 Magento, one of the largest eCommerce platforms, integrated with HubSpot gives you and your business every tool needed for abandoned cart prevention. When your customer places an item in their cart, they want it. If you think of cart abandonment in terms of a “brick and mortar” store, it's like having three out of every four customers leave their cart at the cashier right before leaving. Overall, abandoned cart email strategies help to increase revenue by decreasing the percentage of abandoned carts for your online store. These cart abandoners have the highest likelihood of buying, but there is no way to automate Magento abandoned cart to follow-up with potential buyers. HubSpot, however, can easily track the customers that leave with items still in their cart. Not only can HubSpot track it, but it offers tools to actually email those customers and restore their cart where they left off. This is where Hubshop.ly comes in. While we were working on eCommerce marketing solutions for our clients a few years ago, our developers noticed there wasn’t a great way to integrate Magento with HubSpot to take advantage of the tools offered by both platforms. This posed a huge problem and opportunity for us to create a new extension to merge a powerful eCommerce tool with a powerful marketing tool. Magento is an extremely customizable platform, but it lacks in tools to see how the site is performing. HubSpot is a marketing tool used to track statistics and target customers by reminding them about the items they liked but didn’t purchase. HubSpot even allows you to email coupons to customers as an incentive to complete purchase. In your newly downloaded Hubshop.ly extension, you can set up smart lists to track who abandoned their cart. The beauty of Hubshop.ly is that it can take that list and recover these carts with a fully customizable email workflow to try and get the customer back to the site. In the email, the products in the customers abandoned cart will appear in photos in addition to a session restore link to place the products back in the cart in a new session. Hubshop.ly also allows you to create limitless triggered emails for various occasions like a special sale going on, a coupon code, a thank you email/offer, a product review, a suggestion of what else to buy and even a holiday greeting. This not only keeps your business on your customers mind, but also creates more repeat customers and overall customer satisfaction. In Magento, you already have data from your customers orders. When you use Hubshop.ly to integrate your platforms, you can use HubSpot’s smart lists and reporting tools to gain more insights about your customers. Some of the tools include looking at order data, lifetime revenue generated by each customer, and the products purchased by them. With our clients at Groove we have seen an 18% increase in overall revenue, a 21% decrease in abandoned carts, and even a 10% increase in the repeat purchase rate. Just let that sink in. When your abandoned cart rate goes down 21%, your revenue increases by 18%. That’s almost a perfectly direct correlation. "[HubShop.ly] has worked out very well with our HubSpot account and allowed us to maintain automatic workflows. Very easy to install and use in HubSpot." Still don’t believe us? That’s okay, we have a 14 day free trial right for Hubshop.ly that should convince you. We also have a host of resources for you to learn more about installation and how to effectively use the tool to begin your abandoned cart project. Whether your a large company a small company just starting out, you will face the issue of abandoned carts. It’s just a part of the business, but what can make your company stand out over other online stores is the follow up. Show that customer your business cares with a personalized email thanking them for the visit and saving their cart for them. Offer that coupon that will convert the cart abandoner to a repeating, loyal customer. Magento and HubSpot are both great tools separately, but when you combine them with Hubshop.ly, you will see a huge bump in your eCommerce activity and conversions.It pays to show your customers you care. Have any questions about the tools mentioned above or just want to chat? Request a free eCommerce Assessment below to speak with our team of experts.